Check out Explore Talent's news on Firefly Music Festival 2014's line-up of performers. 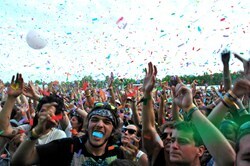 Explore Talent news reports an enormous buzz this week surrounding the highly anticipated Firefly Music Festival this June. This will be the third installment for the festival. It began in the Summer of 2012 and was started by Red Frog Events. It has quickly become one of the most celebrated musical events in the country and the world. It is held at the Woodlands of Dover International Speedway in Dover, Delaware. It is an enormous, multi-stage outdoor Woodstock-style venue that attracts a gigantic crowd every year. In addition to the musical acts, there are many other outdoors and tent-oriented events and activities that the audience can participate in. It’s also a great place for amateur musicians to network and line up musician jobs and singing jobs. Of course, the main question on everyone’s mind every year concerning Firefly is: Who’s playing? For this year's event, June 12-22, 2014, the lineup is sure to not disappoint. Outkast is back together and scheduled to appear as part of their festival tour this year. The Foo Fighters and Jack Johnson will be headlining the event. Other participants include Weezer, ZiggyMarley, Chance the Rapper, and American Authors. The video announcing the full lineup, as well as the list, can be viewed here. The Festival has grown in attendance and star power every year so far, and we expect this trend to continue. Visit, Explore Talent's musician jobs available.